The Abbey School expects every student to have at least 95% attendance. We want our students to achieve their full potential and to progress into their chosen career. Barriers such as poor attendance will hinder, delay or stop their progress. The parents of a student whose attendance has fallen below 95% will automatically be sent a standard letter, this will state their attendance and any further action that may be taken if it does not improve. Attendance is monitored weekly and students may be spoken to and parents invited in. We may authorise up to five days absence if parents have informed us with a just reason why the student is absent and medical evidence produced if requested. Anything beyond this will result in letters being sent and unauthorised absence marks being given. Continued unauthorised absence will result in a Penalty Notice being issued and/or a referral to the School Liaison Officer. 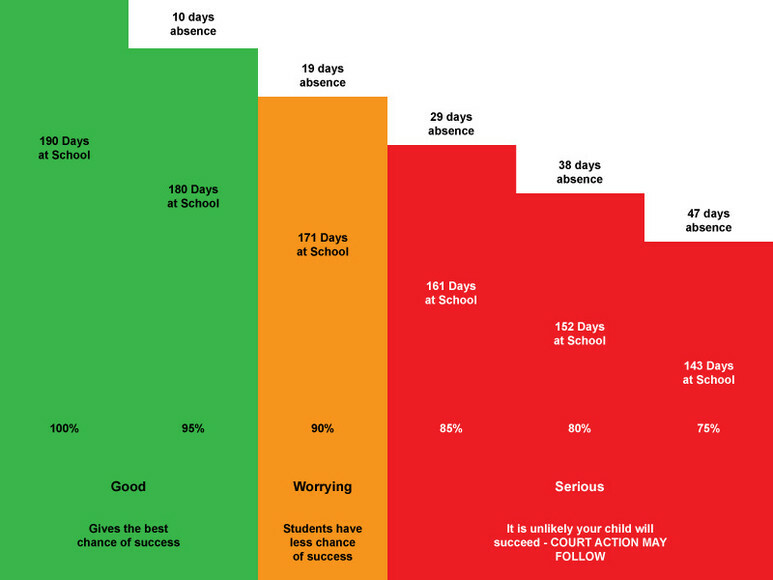 So how does absence affect students? Your child should be in school by 8.45am every day as lessons start at promptly at 8.50am. Any student arriving at school after 8.50am will be deemed late and a detention will be given at break time. If a student arrives after registration at 9:20am, when the register closes they will receive a ‘U’-unauthorised late mark, which may result in a Penalty Notice being issued. To report your child as unwell please call the Attendance Office on 01795 542477 on the first day that your child is not well enough to attend. We appreciate and encourage parents making daily contact to inform us of absences, in certain medical cases some continued absences will be authorised. Parents informing us of absences due to illness does not automatically guarantee it will be authorised, this will be determined by the school. This decision will be based on current attendance levels and whether medical evidence has been provided. We do not expect letters from GP’s but any medication packaging or an appointment card from the Doctor may be enough. If we have requested medical evidence from you and it is not provided the absence will not be authorised. Please send a copy of appointment letters to Mr. Jago or Mrs. Gridley in the Attendance Office, this will enable us to authorise these absences. Parents should try wherever possible to arrange Doctor or Dentist appointments outside of the school day. From September 2013 the Department of Education announced an amendment to the Education (Pupil Registration) (England) Regulations 2006. This removed the Head Teacher/Principal’s ability to authorise leave of absence for the purpose of a family holiday, unless this is for exceptional circumstances. Parents leave allocated by their employer. Parent is a serving member of the armed forces. Family needing to spend time together after a trauma. The list is by no means exhaustive and permission will be given at the discretion of the Headteacher.